Learn key computer science topics to improve instruction and prepare for the Praxis & TExES Computer Science teacher certification test. Thinking about teaching Computer Science, or incorporating CS into a subject you already teach? CS skills are fundamental to student success and you can learn to teach CS! This course is intended for prospective K-12 Computer Science teachers to review key topics in Computer Science required by the certification test. States around the country have adopted the Praxis Computer Science Test as a component of their certification/licensure and this course covers all of the topics in that test and more. In the state of Texas this test is called TExES 241 Grades 8-12 Computer Science Certification exam. Hundreds of teachers from around the country have already taken the course and many have gone on to achieve state certification. Whether or not you plan to take a certification exam, this course will strengthen your understanding of key CS concepts and constructs and increase your confidence in teaching CS. Access to graded weekly quizzes, to track your progress. Access to the comprehensive final, which mimics the actual 100 question CS 8-12 certification exam. Explore the course before you buy it. 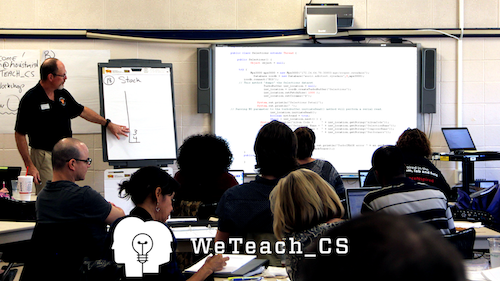 Computer Science Instructor & PD Specialist, WeTeach_CS John Owen is a 20+ year CS veteran teacher in Texas, recently retired and now passionately committed to helping current educators join the CS teaching community. His first mission is to prepare them to take and pass the challenging certification test through the WeTeach_CS face-to-face workshops, as well as through the newly launched online course. He also wants to help new teachers survive and thrive through their first year of teaching CS in the classroom.